Provo is the county seat of Utah County and is the third largest city in the state of Utah. Located just 43 miles south of Salt Lake City nestled along the Wasatch mountains, it is the second largest metro area in the state. Fort Utah was settled 1849 by 33 Latter Day Saint families from Salt Lake City and was renamed Provo in 1850 for Etienne Provost, a French-Canadian trapper aho arrived in the area in 1825. Brigham Young Academy was established in Provo in 1875 and while it began on a little over one acre of land it quickly grew and now enrolls approximately 34,000 students each year, majorly influencing the real estate in and around Provo. Today people are drawn to Provo for educational pursuits, employment opportunities, and recreation. Provo borders the Uinta National Forest on the East side providing endless recreation opportunities for outdoor enthusiasts, and breathtaking views for all residents. Annual Events: America’s Freedom Festival at Provo, Festival Latinoamericano, Sego Festival and more. BYU – BYU is a major draw to the Provo area. For those who come to pursue higher education, to those who come to pursue an amazing football game, the BYU stadium and other buildings on campus are visible from throughout the entire city. Peaks Ice Arena- Built to serve as an ice hockey and practice venue for the 2002 Winter Olympics, this arena currently serves as the home of the Utah County Blizzard semi-pro hockey team. Located next to Seven Peaks Water Park. Brigham Young University – As mentioned earlier, BYU draws in 34,000 students each year. This market of students in need of housing has created a favorable market for investment properties in the Provo area. BYU in addition to drawing students to the area, also provides many employment opportunities, from professor positions to landscaping crews. Business – Provo is home to Novell which currently employs around 2,000 people at its Provo facility. Nu Skin Enterprises, Tahitian Noni Internationals, APX Alarm Security Solutions, and Ancestry.com are also major employers in the area. Provo is consistently listed in Money magazine’s Best Places to Live list. With the Wasatch Mountains right next door Provo provides countless opportunities for recreation. Biking, hiking, skiing, fishing, rafting, rock climbing and more are with a few minutes drive of downtown Provo and with an intricate hike and bike trail system reaching these recreational hot spots couldn’t be easier. With Provo being the home to a major university the opportunities for cultural and educational opportunities abound. BYU is often hosting unique exhibits and seminars that come at little to no costs to the residents. Residents of Provo couldn’t ask for a better place to raise a family. With exciting places like Seven Peaks (one of Utah’s three major water parks), the Bean museum at BYU, dozens of parks, there is something fun for every member of the family. There are many Grants and Assistance programs to assist you in purchasing Provo real estate. Provo has been growing. 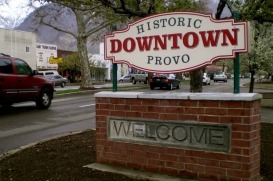 Recent census data indicates that Provo has experienced population growth of 16% since 2000. Consistent with Utah real estate trends Provo home prices are lower than they have been in years, making now a great time to consider purchasing real estate in the Provo area. The Red Sign Team has been helping people interested in buying or selling Provo real estate for years. Our experts are familiar with the market trends for Provo and Utah County Real Estate in general. We are confident that we will be able to provide you with the friendly, knowledgeable, helpful and experienced real estate service that you deserve. Contact us today!